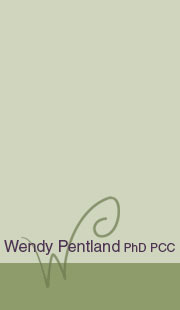 "I worked with Wendy during several key transition points in my professional and private life over the past 8 years. Every session was productive and provided me with the necessary tools to engage in reflective thought and move forward with difficult decisions. Wendy is so easy to talk with and her coaching style and lifestyle analogies makes it a pleasure to share my life story and to take positive steps in the right direction to thrive and flourish. I am in the best shape of my life at all levels (emotional, physical, and spiritual). I owe her a big debt." ~ D.C., PhD, Canada Research Chair. "Wendy was thoroughly enjoyable to work with. Her questions and perspective allowed me to look at challenges in new ways, to break them down, and to overcome many personal barriers. Using our time together I was able to address many of my own cognitive biases, and to look ahead and start planning my future in a constructive way. Any professional or executive would benefit from her coaching skill." "Before working with Wendy I was highly skeptical of the value and effectiveness of Personal Coaching. However, Wendy was recommended to me when I was looking for some good feedback on a career opportunity I was exploring, and I needed to talk to someone who could help me explore the pros and cons of the opportunity in a disinterested and methodical way. As it turned out, not only did I get excellent "disinterested" feedback from Wendy, she also brought real insight and wisdom to our conversation. Since that first coaching session, I have worked with Wendy on many occasions to work through difficult and complicated career and/or people issues. I think Wendy's greatest value to assisting me in exploring any issue or a problem has been her ability to ask reframing questions, that is, to ask questions that help me see the issue from an entirely different angle, or through a new lens. And often, when an issue or problem is not easily resolved by one coaching conversation, which is many times the case, Wendy has been very good at suggesting thought-exercises that are very effective at helping me to work through a problem. I think that the phrase that most effectively captures Wendy's coaching is "informed wisdom". "Working with Wendy taught me the importance and gave me the tools to carve out "me time". These disciplines have helped me enhance my mental and physical health ultimately enabling me to perform professionally at my full potential." "I had a life altering experience as a result of my coaching with Wendy. I went to Wendy to crystalize my personal and professional goals. She was very helpful in developing a plan to achieve my goals. After several sessions, I had a clear path and I have not looked back. Now I work full time, hike, ski, get to the gym several times a week and have much more quality time with my wife. Thank you Wendy for enabling me to improve my work life balance. If you are interested in improving the quality of your life, Wendy will help you clarify what is important to you." "It has been more than a decade since I worked with Wendy and yet her coaching continues to echo in my life each and every day. Somehow she always knew when to nurture and when to challenge. There was a shift in small daily habits that makes life more manageable. And, there was a shift in a single thought .that opened the door and allowed for a profoundly healed family relationship. Together we moved a mountain. I am forever grateful." "I had the opportunity to work with Wendy for over a year in learning how to recognize and manage my stress levels. I gained insight into my triggers, which led me to be successful in reducing and eliminating my anxieties. I still use the lessons I gained from Wendy and often think to myself "what would Wendy say?" My time with Wendy was invaluable and made such a positive change to my life." "Wendy coached me during a period of significant transition during my career. By helping me to identify my core values and my overarching goals , I found it much easier to navigate towards solutions that were sustainable and aligned with my mission in life. I learned tangible skills that I continue to use on daily basis, which help me be more effective both at work and at home. I grew as a person during my coaching with Wendy and am extremely thankful for our coaching relationship." ~ O.H. PhD, Federal government research scientist. "As a physician, it is difficult to imagine doing anything else other than clinical medicine after all of the years invested. Wendy helped me reflect on my personal priorities and wildly explore potential career options to see if I was really ready for a change. I was still nervous when I took the plunge, but I felt better prepared as a result of the personal coaching." "Working with Wendy was in one word: transformative. I started working with Wendy at a time of great transition in my life; my mother had just passed, I was committed to leaving my job for an undefined period of self discovery, and I was trying to start a family. On a behavioural level, Wendy helped me identify habits which no longer serve me and create habits that tap into my inner resourcefulness. On a wholistic level, she helped me identify the light and joy within myself and build a life that honours my inner wisdom." "I first met Wendy when I was looking for a coach to help me work through writer's block. I was struggling to write the book I knew I had inside me but could not seem to get onto the page. Wendy is a skillful and effective coach as well as a lovely person, so working with her is a real pleasure. I always enjoyed our conversations, even the most challenging ones, and quickly felt that I was able to move ahead in many areas of my life. And I finished the book and published it, and what better testament could there be to Wendy's ability to move her clients from their present situation to a future more desired state? Whenever a friend asks me about a life coach, I recommend Wendy." "Working with Wendy as a coach was a powerful and immensely helpful experience. This isn't just talking about your issues; Wendy calls you to action. Her objective perspective helps to clear away some of the extraneous clutter and noise. She challenges your assumptions - about yourself, others, circumstances - through insightful and probing questions and encourages you to look at things differently. Wendy facilitates a process where you gain clarity on your goals and on the real issues you're facing, and empowers you to develop a plan and be accountable for putting it in motion." "Great experience that allowed me the opportunity to self reflect and discuss the right balance between professional and personal goals. Wendy's approach provided environment for me to stretch myself to position me for success in the future." "I will always be grateful to Wendy when, in my 50s, I had the opportunity to make some key decisions about the rest of my professional life. There were key questions about such things as where I would live, and what I would do with the working years that remained, if they were to depart from the status quo. At the time it seemed that I would roll on somewhat inertially toward retirement; and then the opportunity to develop a meaningful working life would be over. I am really glad to have had a productive decade of my life doing the kinds of things that we were worthwhile to me, and to a certain extent my family. I think also that because of that decade, when retirement did finally come, it led to a further productive continuation of my life without a need to chase the unfulfilled 'might-have-beens' that had not been completed earlier. Thank you, Wendy, for the serendipitous circumstances that led to our meeting, and our discussions."